When we reported on Lenovo’s Haswell-E range of ThinkStations, the P500, the P700 and the P900, the visual aspect of those produced a substantial wow factor. The P300 takes a slightly different tack due to its lower price point stance away from HPC workstations and supporting the Haswell processor range instead, but the product itself looks right at home as an under the desk workstation. However, there are certainly a few critiques to level at the feet of the P300. First of which is the DRAM situation. In 2014 it is difficult to imagine a dual-channel capable system being shipped with only one module of memory. It cripples any memory related transaction. To put this into perspective, even the iMac recently released by Apple comes with two 4GB modules as the default option. To alleviate the situation currently via Lenovo's ordering interface requires a $395 upgrade for a $70 stick of 8GB DDR3-1600 C11 memory. That goes beyond some of the surprise when mobile manufacturers announce NAND upgrades. The other option would be to offer a 2x4GB option, however on the US website from my location this does not seem possible, let alone the default option. If a user purposefully wants one DRAM module, they should have to select it, ideally with a disclaimer indicating a potential loss of performance. It is worth noting that a user could add in their memory into the system, although that typically violates most warranties or direct support requests. At this point I would implore Lenovo to offer a 2x4 GB option at the same cost as the 1x8 GB option and it would receive a lot better press. Secondly is the upgradability. The motherboard designed for the P300 has at least three free SATA ports and an x16/x1 arrangement on the full length PCIe lanes. This is fine if you have no plans for future upgrades, but it puts a spanner in the works if anyone wants to add more internal storage or a second workstation level PCIe card. The SATA ports are arranged in such a way that any long PCIe device will be blocked by the SATA ports. The PCIe lane arrangement also favors the top card in all situations, whereas an x8/x8 arrangement would give each PCIe device equal billing (given that all PCIe coprocessors such as Quadro, FirePro or Xeon Phi will work at x8). The motherboard is a micro-ATX size, indicating that more function can be added, otherwise one might have seen a mini-ITX be used instead. To add to the upgrade issue, there is only default space for two storage drives, so users wanting more than two SATA devices alongside their ODD will need to re-purpose one of the large ODD bays. The power supply is right on the money in terms of power and rating, although the lack of extra connectors for PCIe devices should be noted. The 24-pin ATX power connector is also split into several parts due to the motherboard layout, making a simple replacement difficult. If you want something bigger, Lenovo would have to supply it. Another issue is the storage itself, where Lenovo included in our system a 1 TB SSHD from Seagate. While this might seem the best of both worlds in terms of SSD and space, I would argue that a workstation that costs $2150 should get an OS SSD and a 1-2 TB storage drive, even if in a caching arrangement. One thing I liked about the P300 is actually related to the Quadro selection. The build we received had a Quadro K4000 3GB, which retails for $800. This is a professional grade GTX 650 Ti for all intents and purposes with 768 CUDA cores at 810 MHz. When we received the system, Lenovo offered an upgrade to the K4200, or the equivalent of a GTX 660. This means a rise to 1344 CUDA cores (+75%) at 780 MHz for only an extra $175 (16%). For anyone that uses software that can be sped up by a Quadro card, this is an example of a no-brainer upgrade. At the time of this review going live, Lenovo has now placed the K4200 as the default option, making everyone take advantage of the faster card. 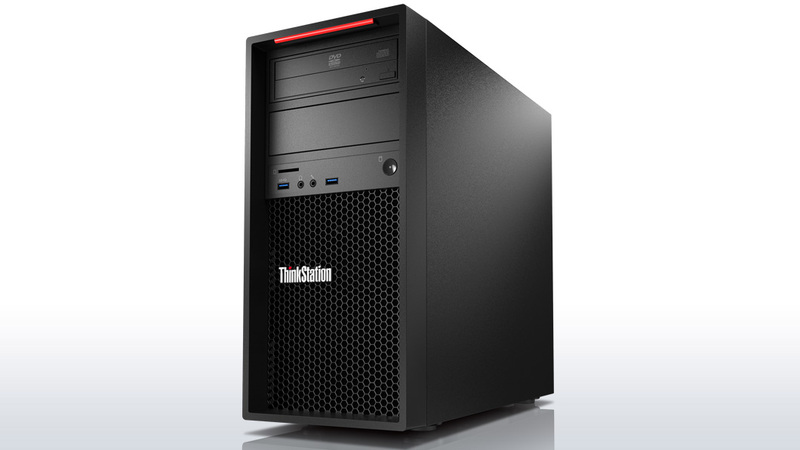 If a user wants more though, Lenovo suggests moving up to the P500. The option to offer Windows 7 with disks to upgrade to Windows 8 is commendable. While Windows 8/8.1 is the default for many pre-built systems, many users still like Windows 7 depending in their use scenario. This costs nothing extra when choosing the system. Overall performance of the P300 system we were sent came in line with a Haswell i7-4770 albeit with only a single memory channel equipped. This had repercussions on our memory intensive software, especially fluid dynamics and OpenSSL. If you went out and built this system today, it would cost around $300-400 cheaper than what Lenovo is offering, although Lenovo’s system comes with their extended ThinkStation support and all that entails. If you upgraded to dual channel memory, that difference between Lenovo and self-build expands to over $600. Even in terms of warranty and support, that is a financial pill to swallow, especially as this workstation focuses on the entry level producer whose budgets might be lower than expected. I would ask Lenovo to offer a 2x4 GB memory option and place it as default, with 1x8 GB as the next option while giving a disclaimer. The next update would be the SSD/storage drive combo, either as is or in a Smart Response arrangement. If all this can be done at the same price, we are on our way to a nice little system.